Set ten years after a fictional financial collapse, in the Australian outback, David Michod’s follow up to ‘Animal Kingdom’ is a bleak and desolate tale of a man with nothing left to lose. The story begins when Eric (Guy Pearce) has his car stolen as he sits in a rundown bar by a gang of criminals led by Scoot McNairy’s Henry, and he sets off to get it back. Initially it’s unclear why the car is so important to Eric, when he’s lost everything else and acquiring another vehicle isn’t overly difficult, but like many things in this masterfully paced film, it begins to make sense as time goes on. The film gains extra impetus when Eric finds Henry’s brother (believed dead by the gang), lying by the side of the road with a bullet wound to the chest. A tentative alliance begins to form between the men as Eric seeks him medical help on the promise that he will lead him to Henry and his car. Along the way, they encounter criminals, broken men and limited law enforcement, and the rundown world is like a throwback to the wild west with every man out to fend for himself. The film lags in spells, particularly in the middle half, but it’s largely saved by two phenomenal performances from its lead actors. Guy Pearce has been turning in excellent performances for years now, and it’s no surprise that he is at his absolute best here. His Eric is a man with nothing left to lose, full of resentment and with an internal rage that he can’t avoid from bubbling to the surface. More surprising is the fact that Robert Pattinson is also excellent, as the man he finds by the side of the road. Pattinson has never been great in anything I’ve seen, and often seems cold and distant in his performances, but he pulls off a stunning showing here with a nuanced performance as the simple minded brother who got left behind. 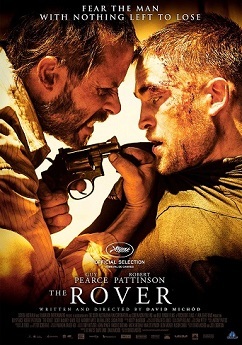 The interactions between Pearce and Pattinson are powerful and help to fill in a lot of detail about the characters.